Bubbles and Blossoms: The McGaugh Family Blog: Happy Father's Day! 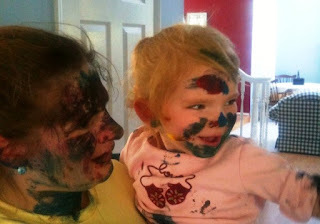 Among the many things childhood ought to be, it ought to begin by being fearlessly messy. In those moments of carefree abandon children learn best, I think. The creation of art is a time to let go and to embrace creative impulses. When there are rules for nearly everything else, children need sacred space in which to follow instinct. Katie and I had tremendous fun this afternoon creating Daddy's and Boppa's Father's Day presents. Using tempura paint and large pieces of paper, Katie used feet, hands, and brushes to decorate. We have yellow, blue, and red tempura. I asked her which two we would mix to make green, and she said, "Blue and yellow!" After we had made our artwork and I set it inside to dry, Katie wanted to paint her feet and legs. "Go ahead!" I said, "Have fun with it!" Sooner than we knew it, she was painting her arms, too. Then she wanted to paint my arm.... and before we knew it, we were both painting each other all over! It will always be one of those golden moments with my daughter that I never will forget. She was laughing and so full of joy. "How about a blue nose?" I would tease her, and her revelry was complete. She loved painting my face, too...and my hair...and earrings...and neck. Pure silliness; pure delight. I love those moments when she discovers she can embrace a silliness that she might have thought impossible: how often do we ever paint ourselves? It is almost as though I can see part of the world open for her, as though I can see her penetrate a deeper understanding about what life is really for: to laugh at, to live passionately, to know when rules do and do not matter. Silliness often brings us closer to real philosophical understanding. Here we are. I look pretty frightful (particularly with my painted lips), though Katie looks cute and you can see that she loved the first glance of our painted selves. Afterwards we went outside and sprayed each other with the hose. She loved chasing me with it. With the Temecula breeze, we got a little cold so we came in and cleaned up and changed. We prepped dinner and dessert (brownies) for later, reminisced about meeting a nice doggy earlier this morning on our walk, had some lunch, and settled into reading and a nap. I studied for my test a little more, and then we walked Boppa's painting over to his house while dinner cooked in the oven (so nice to live so close)! Later, Katie gave Daddy his painting just before dessert. I love her little rainbow footprints. This will be precious to have as she continues to grow. Happy Father's Day to Bill and my dad! We love you guys!